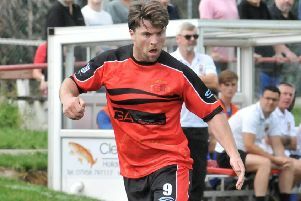 Garstang boss Lee Baker believes their recent results bear out his bellief in the Riversiders’ squad. Baker’s players face Steeton this evening, looking to record a sixth consecutive league victory after racking up the goals in the last week. Having scored five in beating Chadderton a week ago, the Riversiders scored eight in swatting aside Shelley last weekend. It leaves them ninth in the Hallmark Security League First Division North table, nine points adrift of third-placed Prestwich Heys but with as many as three games in hand on the sides above them. “We didn’t have any ambitions to win anything,” Baker said of their first season at the former North West Counties level. “I’ve always said that when I have my full squad available, I believe we can compete with anybody. “We still have people like Alan Coar missing, who is one of the top scorers in the league without playing as many games as others have. “I think what’s evident is that I’m getting a few players back from injuries – and our injury situation has been horrific. “They haven’t been little, minor injuries; they have been long-term ones but you get one back and they tend to drag another one with them. The Riversiders’ run of wins started with the Boxing Day victory against Longridge Town after losing four of the five matches beforehand. However, Baker was not too downhearted by that with one of those losses – the Lancashire Trophy game with Southport – giving him cause for optimism. “They were very lucky to go away with the win,” he said of Garstang’s 3-1 loss in mid-December.